How diverse is Wyoming? You might be surprised. Two hundred people came to a February multi-cultural Wyoming Cultural Collaborative Fair at the Civic Center on a cold, snowy day--where residents with roots in Nepal, Greece, India, the Philippines, Thailand, Jamaica, Cyprus, Nigeria, Native American Tribes, China, Mexico, and Bhutan shared food, music, dancing, toys and more from their heritage. This first Cultural Collaborative event was so successful, the committee is planning a bigger one for spring. On May 11, from 1:00 p.m. - 5:00 p.m. on the Village Green, they’re hosting a Wyoming World Food and Music Festival. At the festival, you will be able to tour international flavors from a range of local chefs and artisans; pick up handicrafts with roots around the globe; and kick back or dance the day away with live music that represents the diversity of our area. There will be activities for the whole family, along with special kid-friendly and adult beverages for sale. Bring lawn chairs or a blanket so you can stay a while. 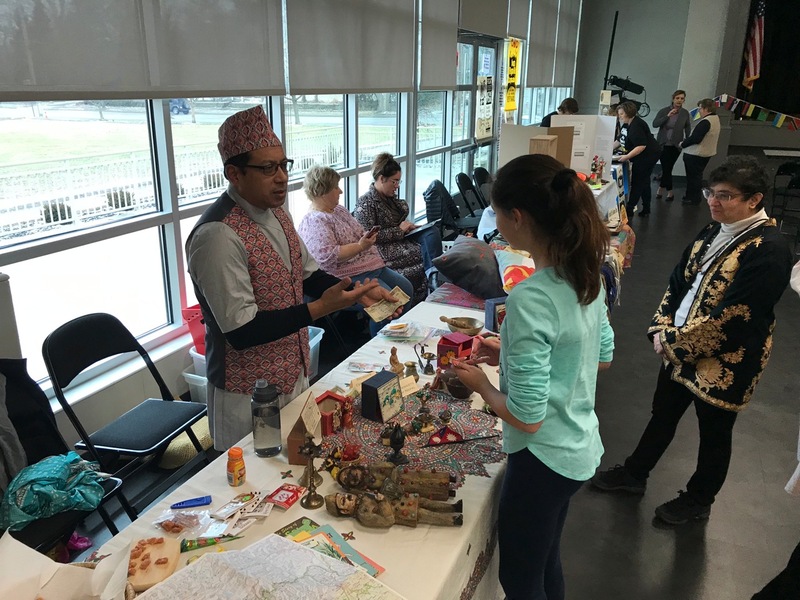 The Wyoming Cultural Collaborative Fair was held in February at the Civic Center – that event led to the creation of the new Wyoming World Food and Music Festival. The festival, tag-lined “Taste the Love,” will happen rain or shine. Entry is free, and everyone is invited: Wyoming residents and their friends and families; along with neighbors from Lockland, Woodlawn, Springfield Township, and Hartwell. It’s a day to mingle with your neighbors and make new friends from around the Mill Creek Valley. The Collaborative, composed of LeRoy, fellow Council Member Sarah Stankorb Taylor, City Manager Lynn Tetley, residents Monica Tuck, Beth Piocos, Rich Robles, Milan Dukic, Sheryl Rajbandhari, Marina Garcia, and Eve Mayes, and festival sponsor Lynn Love of LLSpirits, envisions something like a Findlay Market Second Sunday on Main event, only closer to home. “Extending the hand of friendship to our neighboring communities is especially important to all of us,” adds Sarah Stankorb Taylor. “We can be a close-knit town and celebrate what’s special about our entire region. The February event was put together in a matter of months, and the Collaborative wants to channel the buzz it created (975 people have joined the festival Facebook page) into fun events that appeal to everyone. • As of this writing in mid-February, committed food vendors include Andy’s Mediterranean Grille, Teranga, La Casita, and Street Pops. Station Family + BBQ will create picnic baskets for carryout. More of the many international small business food purveyors located in the Valley will be added. Plans include having inexpensive “taste-sized” portions so guests can try a variety of flavors. • Entertainers booked so far include Baoku, an African drum and world fusion band; Toca Madera (music of Latin America and The Caribbean); and belly dancers. • Vermont Elementary School’s third-graders are preparing an international craft for children to enjoy at the festival. • Taft’s Ale House will have Nellie’s Keylime beer for sale. Save the date now so you can take a trip around the world without leaving Wyoming! To volunteer or for more information, visit the event’s Facebook page (Wyoming World Food and Music Festival, Taste the Love), or call 821-7600.